We’re continuing Frozen Treat Week with a super simple but elegant recipe: Coconut Hibiscus Granita. Refreshing and utilizing two summer trends – hibiscus flowers and coconut water. 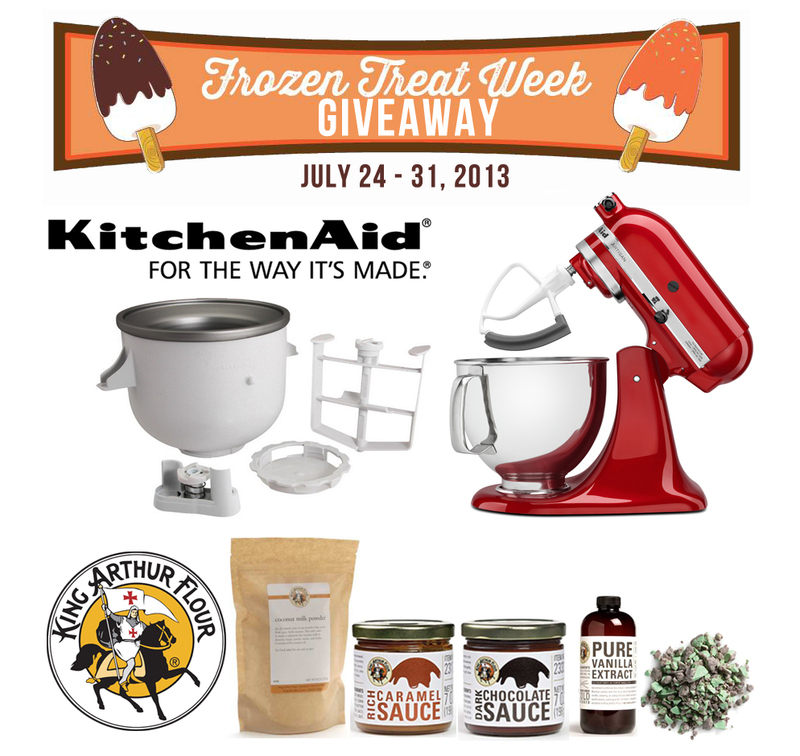 And don’t forget to enter today’s giveaway thanks to KitchenAid and King Arthur Flour! Summertime is all about simple, delicious desserts. 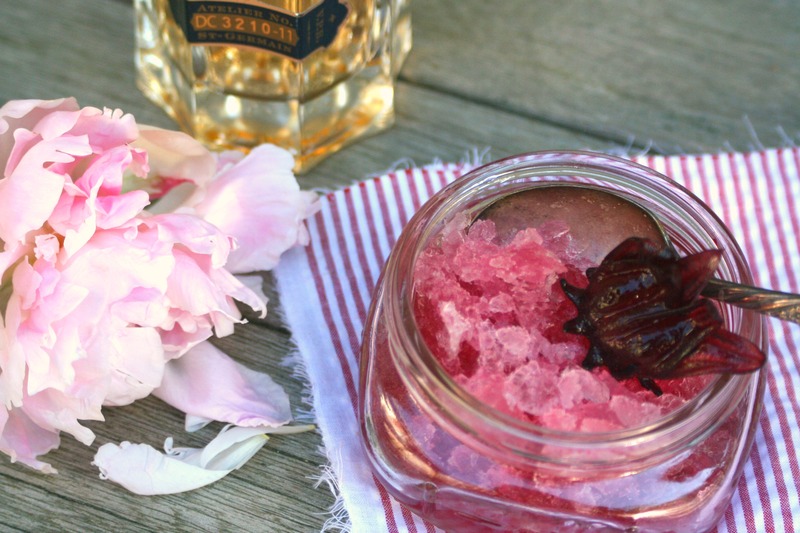 Desserts like this Coconut Hibiscus Granita that can be served as an amuse (before your meal to tease the palette), as an intermezzo (to cleanse the palette), and as a full dessert course, which makes it the perfect summer recipe to have in your back pocket! And honestly, it’s not even a recipe but a basic notion of balancing flavors. You want a sweet granita, in this case sweetened with the raw coconut water (naturally sweet) and the hibiscus syrup. Using those flavors as a base, you can now tweak the recipe with a bit of acid from your favorite citrus fruits, in this case we used lime juice. 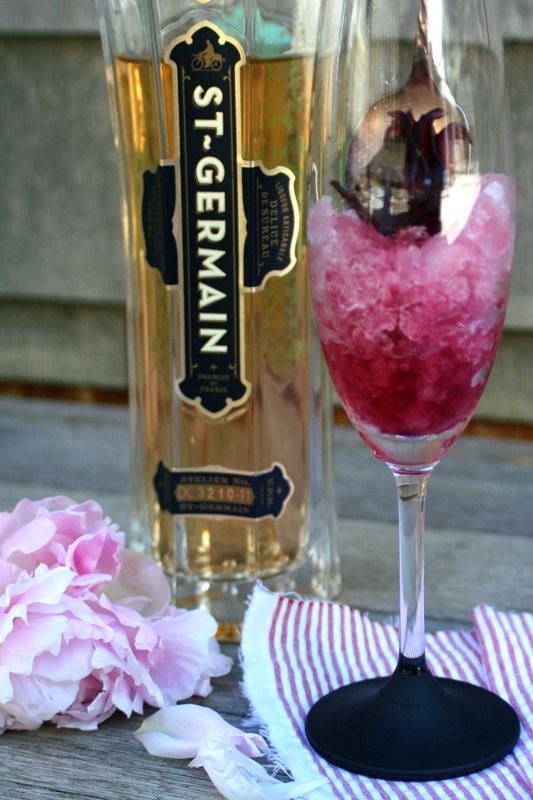 For a more adult dessert, serve in champagne flutes and splash in some St. Germain (elderflower liqueur). It’s floral and aromatic, pairing perfectly with the Wild Hibiscus syrup. Happy Summer, now go make some granita! A simple treat to serve as a sorbet, intermezzo, or dessert on a hot night! Whisk together coconut water, Wild Hibiscus syrup, vanilla extract, and lime juice. Pour into shallow baking dish and freeze for an hour. After the first initial hour, scrape the pan using a fork every 30 minutes. After 2 hours, small ice crystals should have formed. Drizzle with your favorite liqueur, top with fresh berries and Wild Hibiscus flower petals. Serve immediately. And today is your chance to enter to win the giveaway of a lifetime – a KitchenAid Mixer and amazing goodies from King Arthur Flour. Y’all know I’m in love with my brand new KitchenAid mixer (that I scored from Gilt on sale!!) as well as my devotion to all things King Arthur Flour. Be sure to check out their websites for updates, sales, and recipes! Thanks KitchenAid and King Arthur Flour for being so awesome! This is absolutely magnificent, scrumptious, delicious, super yummy coconut hibiscus granita. Can I post it on my blog? Please do not post on your blog unless you adapt the recipe and link back to me! Gorgeous pictures. I made these coconut hibiscus granita for the super bowl party and it was a crowd favorite. I’m also gonna pin this post on my Pinterest board my followers will love it. Thanks for sharing..
Nella you are so creative! I love the flavor combination of the coconut and hibicus. The color is so romantic looking, I absolutely loooove it! This looks amazing. I really want to get my hands on that hibiscus syrup. It looks so tasty. This granita looks so refreshing and tasty! I love this granita!! I need to get some of the hibiscus syrup asap to make this!! Nella, where do you get the coconut water? This sounds so delicious, I wantwantwant! This granita is amazing! It looks so very classy. Entered the giveaway, fingers crossed!! This granita is gorgeous! I love the lovely summer flavors. I’ve only experimented with hibiscus once, in pots de creme but loved it. This sounds like an excellent recipe for my second experience. Mmm such a great color! Looks delicious and refreshing. This looks fantastic! Like a grown-up version of a snow cone…so much fun too! there is nothing better than homemade ice cream – cool, rich, intensely flavored and so very creamy! What a fabulous prize package, do hope I win! But I’m not greedy…shared with my friends on FB! I don’t think I’ve ever actually anything hibiscus flavors! But what better way to start than with this refreshing summer treat? ?